Some places seem to have all the luck. Take the Okanagan Valley of British Columbia, with its sinuous blue lake, green hillsides, bright high-latitude sunlight, hot summers, and surprisingly rich soils. As if that weren’t enough, it all comes together to create great wine. 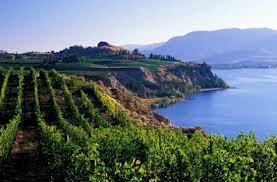 It’s easy to appreciate the Okanagan Valley’s charms from the Terrace Restaurant at Mission Hill Family Estate winery. As we ate salads of local August tomatoes and sipped glasses of pinot blanc, we looked down the steep vineyard rows to the lake. It’s the Okanagan experience in a nutshell. Built on the foundations of a 1966 winery, Mission Hill is one of the oldest and largest in the valley, a region that wine specialists considered a jug-wine district at best when Vancouver wine merchant Anthony von Mandl bought the estate in 1981. But the skeptics were wrong. Today there are more than 125 wineries and the Okanagan Valley has become one of the most exciting frontiers in quality winemaking. Like all frontiers, it has lured its share of big thinkers and dreamers.